» Wait, Is Paul McCartney Actually Fronting a Nirvana ‘Reunion’ Tonight? 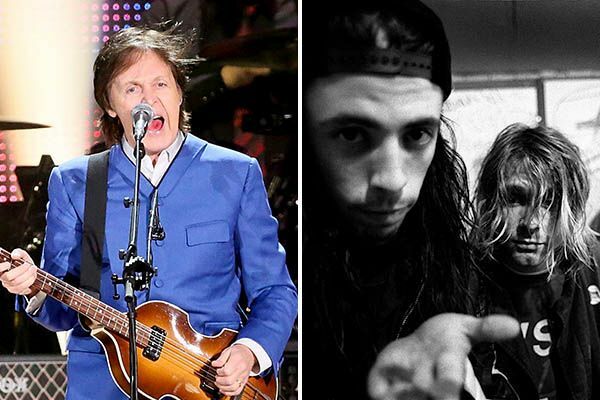 Wait, Is Paul McCartney Actually Fronting a Nirvana ‘Reunion’ Tonight? The Sun were the first to report it: “Paul McKurtney: Beatle replacing Kurt Cobain in Nirvana,” the British tabloid’s headline read, along with a Photoshop of, as per its caption, “Paul as Kurt.” (Take a minute to check it out. It is marvelous.) The story was that, at tonight’s mega-benefit telecast 12.12.12: The Concert for Sandy Relief, Paul McCartney would sit in with Dave Grohl, Krist Novoselic, and Pat Smear — respectively, the drummer, bassist, and touring guitarist of Nirvana. Supposedly, McCartney’s statements on the matter were: “I didn’t really know who they were. They are saying how good it is to be back together. I said ‘Whoa? You guys haven’t played together for all that time? And somebody whispered to me, ‘That’s Nirvana. You’re Kurt.’ I couldn’t believe it. '” Oh, also: They are supposedly going to play a new song, one that they’ve written especially for the occasion. but no. Come on: “That’s Nirvana. You’re Kurt”?! So I emailed the PR firm that, conveniently, represents both McCartney and the Foo Fighters, anticipating a swift denial of the Sun‘s cockamamie story. And then that PR firm got back to me with a “we can neither confirm nor deny” and a “you’ll have to watch tonight to find out.” So: Yes? “Paul as Kurt,” or something similar enough, might be going down, and if it does, it will probably be so epic as to end all hurricane disasters forever. You now officially have our permission to continue knocking yourself out, Twitter.